world have called NYA home. 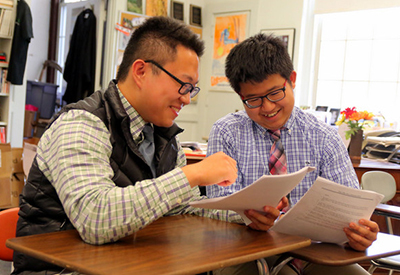 North Yarmouth Academy enjoys a long tradition of welcoming international students to the community. Most of our international students live with host families arranged by NYA or other independent organizations. 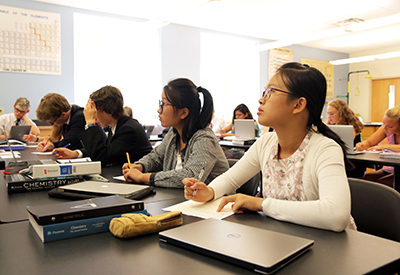 In recent years, students from Austria, Canada, China, Germany, India, Spain, and Sweden have chosen to study at NYA. 2. An on-campus interview is preferred, but when a visit isn’t an option, a video Skype interview will be conducted. 3. In addition to the application, international students need to demonstrate English proficiency. TOEFL scores are preferred. SSAT scores are accepted, as well. Contact the Admission Office with additional questions. NYA’s SSAT code is 5422. Each student is responsible for obtaining or purchasing their own books. Once you have received your I-20, you must visit the Study in the States website to ensure you’ve taken all the necessary steps to enter the USA. While an I-20 will be issued after the above steps are taken, an international student may not start school until the balance is paid in full. For students requiring assistance in finding a host family, NYA can help. Once enrollment is complete (signed enrollment agreement and deposit) you and your family will be connected with our International Student Coordinator.